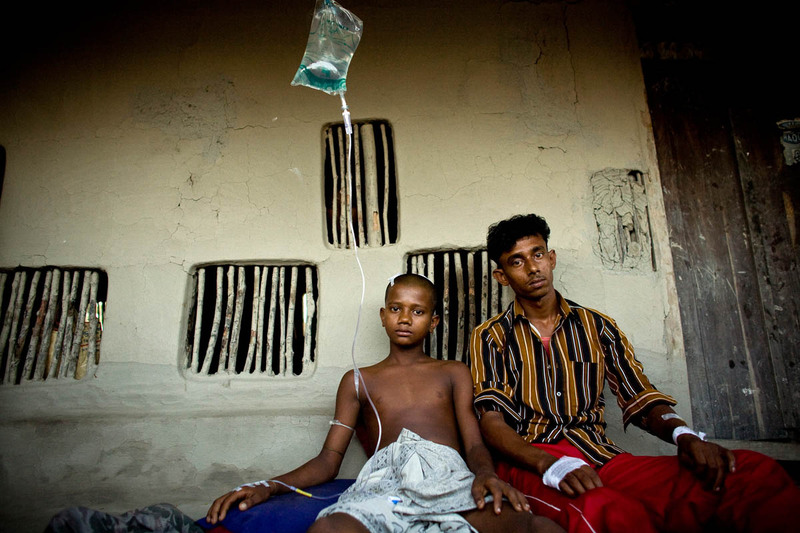 13 year old Ruhel and 18 year old Rubel are seen outside their home in the Sunderbans May 2010. Ruhel and his cousin Rubel went to fish for crabs in a narrow canal called Tuskhali in the forest. Sailing into these canals is extremely dangerous because the boat is surrounded by dense forest on either side, making it impossible to spot a tiger until it is too late. Ruhel and Rubel were sailing through the middle of the canal when the tiger leaped into Ruhel, clawing his head, back and chest. Rubel grabbed the tiger by it's paw and tried to push it off his cousin, injuring his arms but scaring away the tiger.